The next morning brought clear skies and cold temperatures, this was to be the only window we would have for making an attempt on the glacier. We left the campsite early, and began the steep climb through tussock and alpine shrubbery to the ridge on the true right of Collins Creek. The first rays of morning sun warmed our faces as we made it out of the valley, and we were stoked to see a Kārearea surveying us from above. We continued up a steep tussock gut to the ridge, then followed the crest towards the main Olivine Range. Easy scrambling over once glaciated rocks allowed us to make good time, although plenty of loose schist and the occasional patch of verglass required attention and careful limb placement. We reached pt 1660 on the main ridge just after 12pm, and it became obvious that the next 1km long push to the glacier would be a stretch, with broken and exposed ground promising slow travel. With a front forecast to move through later that afternoon, we decided to call it where we were. Although disappointed that the glacier was off the cards, we were content in the knowledge that we were standing in a place few others had been, enjoying uninterrupted views of the Red Hills and Tasman Sea in the West, and the Waipara Range and Mt Aspiring in the East. Summer Snowline Survey has tracked the gradual decline of the glacier since 1981, something that would have fascinated and horrified John in equal parts. We all vowed to return before the glacier disappeared completely, and made mental notes of possible routes while watching a pair of Rock Wren zoom around us. The return trip to our campsite passed without incident, and by 6pm we cracked the whiskey and toasted our somewhat success under the brewing SW front. Shaun whipped the gold pan out again, first for the unconsolidated gravel on the banks of the creek, then for a delightful dehydrated beef stroganoff. On the 7.30pm mountain radio sched, Martin from Dunedin forecasted more rain followed quickly by a substantial cold front with snow to 300m, effectively putting the final nail in our original plan of traversing further north along the ridge before linking back up to the river. We resigned ourselves to repeating the heinous bush bash in reverse the next day. camp before pack rafting out the following day. Again the scrub bash passed in a whirl of scratches, slips and swear words, and with relief we made it back into the forest just as hail stones began bouncing off our hoods. Libby wisely decided that the only animal fit to inhabit the thick, sodden bush was a waterproof monkey, but this was soon proved wrong when we were followed by a pair of chattering Kaka. Soon after we found ourselves in a bit of a pickle. to the river with 6 of us wedged into one sloping tent was less than appealing, but back tracking was out of the question and daylight was running out. Fortunately the boys found a marginal crossing downstream, and we rigged a line to hold while crossing, making it slightly less marginal. crawled into our sleeping bags to feast on vacuum packed pizza and fruit cake as darkness fell. Everyone knew that we had pushed it a bit too far that day, and we were lucky to escape relatively unscathed. We inflated and packed the rafts while battling the most voracious swarm of sandflies any of us had ever encountered, with my face copping the brunt of their belligerence. Fortunately pack rafting the river proved to be an absolute stroke of genius, and we made excellent progress of downstream while imagining how unpleasant the 40km walk out would have been. The paddling was straightforward, with the only hazards coming from submerged trees and a large mob of cattle that decided to cross the river right in front of us. The threat of cold water and gear loss made flipping the rafts very unappealing, and we were glad to have a decent white water paddler in each raft. Our second brush with hypothermia came after a few hours on the water, necessitating a quick stop on a gravel island to warm Libby up. Dry socks covered with plastic bags, a DIY drytop (raincoat sleeves taped to wrists) and a Nalgene filled with hot water and shoved down the front of her life jacket proved to be prefect antidotes. departed from five days ago, watched the dust we had missed slip by, and took a moment to reflect. Although we didn’t get the familial gold we had come for, nor have much luck with the pan, the trip had brought us riches in other ways. We had pushed hard, endured foul weather and fouler bush, and learnt some valuable lessons. It was comforting knowing that we had travelled through part of the country that was just as wild as it had been 80 years ago, when our grandfather had done the same. We felt like we had a decent adventure, where every decision we made had real and immediate consequences, and the outcome was never certain. I’d like to think that John felt the same way on finishing his trips, and I’m sure he would have been immensely proud of us. different route, and hopefully with a better forecast. Bay to jet boat us in, and Arnold Heine (Hutt Valley Tramping Club) who provided us with details of previous trips and amazing photos of our grandfather in his element many years ago. Thank you all so much! 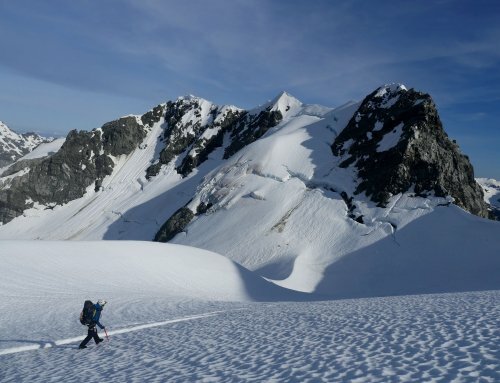 This trip was made possible with support from a FMC Youth Expedition Scholarship, with funds that came from the FMC Mountain and Forest Trust and the Maerewhenua Trust.